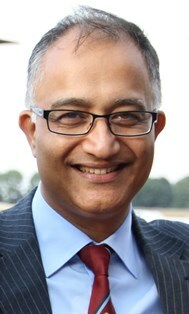 Mr Sharma trained and worked as a Consultant in Obstetrics and Gynaecology in the Indian Armed Forces before moving and settling in Yorkshire in 2003. He has been working as a Consultant at Mid Yorkshire Hospitals since 2009 and became Head of Women’s Services in 2017. He is also the Clinical Lead for Gynaecology Cancers for the Trust and regularly performs total laparoscopic hysterectomy for early endometrial cancers, laparoscopic removal of ovarian cysts or removal of ovaries to prevent cancers in BRCA gene mutation carriers. He has been treating women with heavy periods by performing endometrial ablation. He manages fibroids through hysteroscopic resection of submucous fibroids, myomectomy or hysterectomy. He regularly performs vaginal prolapse surgery and treats vulval diseases. He has a special interest in management of menopause and prevention of osteoporosis. Mr Sharma is passionate about teaching and trains colleagues and junior doctors in laparoscopic and hysteroscopic surgery. Mr Sharma has a special interest in the prevention of gynaecological cancers and performs keyhole surgery to prevent ovarian and uterine (womb) cancer. In the spring of 2018, Mr Sharma achieved his lifelong ambition of becoming a qualified skydiver. He enjoys running and gets tremendous satisfaction raising money for various charities by taking part in full/half marathons and treks. He leads a team every summer at the Yorkshire 3 Peaks Challenge. He enjoys different cuisines and loves cooking and spending time with his family including two daughters. Mr Sharma has been involved in clinical research in osteoporosis and menopause at the University of Hull. This involved bone densitometry, evaluating alternatives to HRT and research into the prevention and management of osteoporosis and menopausal problems. Mr Sandeep Sharma does not hold a share or financial interest in this hospital, another Nuffield Health hospital or the company. Mr Sandeep Sharma does not have a share or financial interest in equipment used at this hospital or another Nuffield Health hospital. Mr Sandeep Sharma does not hold any paid advisory role(s) at this hospital or on behalf of Nuffield Health.